Q What is dolphin hunting? In certain countries – predominantly Japan, Peru, Denmark and the Solomon Islands - dolphins and other small whales are captured and killed using inhumane methods for commercial purposes. The hunts are unregulated, so many thousands of small whales are killed. In Japan, where the largest hunts occur, up to 20,000 dolphins, porpoises and pilot whales are killed each year. Over a million have been killed in the past 70 years. In the waters off the coast of Taiji, the main dolphin hunting town in Japan, dolphins and pilot whales are hunted using a method called "drive hunting". In a drive hunt, a fleet of high-speed boats encircles a pod of dolphins or whales, which may contain over a hundred animals. The fishermen lower steel poles into the water and repeatedly bang them, creating an underwater "wall" of sound. Panicked, the dolphins or whales attempt to flee the encroaching wall. But the boats drive them towards the dangerous shallows, and into a narrow cove which is sealed off with nets, trapping them inside. An essential element of this technique is to drive the dolphins towards the shore at high speed, such that they are exhausted (indeed some drown or have cardiac failure during the process) and can be manoeuvered easily into the cove. Dolphins who still have sufficient energy to struggle by the time they reach the cove are roughly manhandled into the shallows by divers. After a period of being trapped in the cove, usually one or two days (without food), the fishermen slaughter the dolphins by thrusting metal rods into their backs behind the blowhole. Wooden plugs are forcefully inserted into the open wounds. While this is useful to the fishermen to prevent blood seeping into the area of the cove visible to observers, by inhibiting the rapid outflow of blood, this practice prolongs the animals' deaths. Video footage shows it can take up to seven minutes for a dolphin to die. While the above description appears so awful that one might think we have exaggerated parts of it, it is unfortunately completely factual. 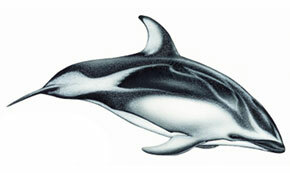 If you'd like to know more about commercial dolphin hunting, please find a page about it here. Q When do the hunts take place? Dolphin hunts take place in the Japanese town of Taiji most days for half the year. They start in early September and last into March. Q Why do they do it? Dolphin hunting is a commercial activity motivated by profit. A profitable trade: A Porsche and Ferrari in the dolphin fishermen's car park. Image courtesy of Martyn Stewart. The primary motivation for the hunts is the capture of live dolphins to be sold to aquariums for what can be over AU$100,000 per dolphin. Once a pod has been trapped, dolphin trainers arrive to select those dolphins and whales they consider will be best for aquariums. Dolphins and whales deemed not suitable for aquariums are slaughtered for meat. Though demand for dolphin and whale meat is waning in Japan, it is still eaten locally and a dolphin carcass brings around $600. Q Who’s involved in the hunts? A very small group of people is involved in dolphin hunting. In Taiji, around 30 “fishermen” conduct the hunts and slaughters. 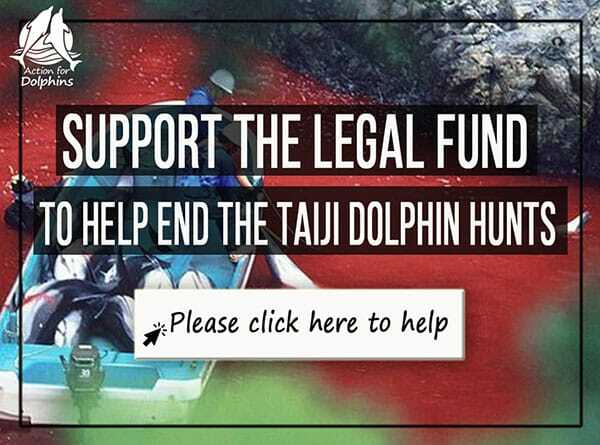 The Japanese government and the local Taiji government support the hunts, and the local police protect the fishermen and guard the slaughter area. There are also secondary beneficiaries, such as the dolphinariums that purchase dolphins captured in Taiji and the local government-owned Taiji Whale Museum, which brokers the sales. But most residents of Taiji are not involved in the hunts, and neither of course are the vast majority of Japanese people. AFD would like to emphasise that the argument against dolphin hunting is not with the Japanese people, but with only a handful of greedy fishermen and other people who profit from this gruesome practice. Q What's a drive hunt like for the dolphins? We can't be sure of what dolphins think or feel, but we can imagine that being the victim of a drive hunt would be a terrifying and painful experience for the dolphins who endure them. Imagine, for instance, being forced to run at top speed on a treadmill until your heart begins to fail, which may be similar to the experience of dolphins chased by boats for hours at top speed. You could be forgiven for not wanting to go as far as imagining what having a metal rod plunged into your body without anaesthesia would feel like. A veterinary analysis conducted by scientists from the University of Bristol and City University in New York and published in the Journal of Applied Animal Welfare Science concluded that the killing method would register “at the highest level of gross trauma, pain, and distress”. People who have observed the slaughters will tell you that the shrieks of the dolphins and whales resonate around the cove. Still, for dolphins and whales, which are amongst the most emotionally intelligent of animals, the psychological impacts may outweigh even the physical pain. For instance, dolphins and whales have strong family ties, so it is possible that witnessing the violent slaughter of family members could be a highly distressing experience for them. Q Australia kills cows and kangaroos – how is this any different? AFD does not condone cruelty inflicted on any animal anywhere in the world. But the extent of the cruelty against dolphins at Taiji can clearly be distinguished from modern farming practices, including those of Japan. In Australia, farm animals and kangaroos are protected by regulation designed to minimise suffering (for instance, the standards governing the slaughter of livestock require stunning so the animal does not feel pain when it is killed). In Taiji, there is no regulation to minimise or even reduce suffering. The most callous and cruel treatment imaginable - for instance, running over a dolphin with a boat propeller then leaving it to slowly drown - goes on daily. During their deaths (by spearing with metal rods in an uncontrolled setting), the dolphins are not anaesthetised, and are fully conscious as they slowly bleed out. The death is prolonged by the cork plugs the dolphin hunters insert into the wound to stop incriminating blood seeping into the cove. It would be illegal in Australia for an abattoir to inflict such gross cruelty on a farm animal, as it would also be in Japan. Q Why is dolphin hunting in Japan any of our business? The dolphin slaughters take place in Japan, but the dolphins killed aren't Japanese – they are their own individuals, and a wonderful part of the entire planet. We feel that if dolphins are being harmed by humans in one corner of the world, it's everyone’s right to try to speak out for them. Equally, we believe Japanese organisations have every right to protest wrongdoing to animals, wherever in the world they are occurring. Q What can be done to stop dolphin hunting? An observer on the shore of Taiji's cove feels helpless. 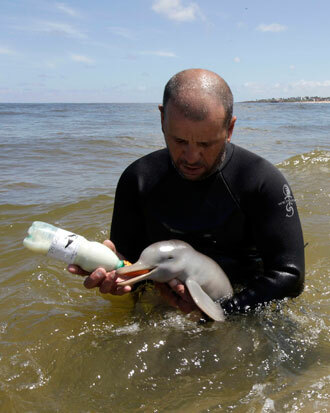 There is nothing that can be done then and there to help the dolphins. The ever-present police stand ready to arrest anyone who approaches the dolphin boats or the slaughter area. All one can do is stand by and watch. But while we can't directly intervene, there are ways we can help. Dolphin hunting in Taiji is a terrible but contained problem, and we believe bringing it to an end is achievable. AFD will use all peaceful and lawful means to stop the hunts. You can read more about our campaigns here. If you'd like to help, please become part of this urgent effort by joining us as an AFD Dolphin Defender today. Q Aren’t dolphins protected legally – why do I need to help? Unfortunately, and for no good reason, dolphins and other small whales are not protected under international law. Large whales (such as humpbacks) are protected by the International Whaling Commission (though of course, despite their legal protection, Japan still kills large whales under the fraudulent pretext of “scientific research”). Small whales including dolphins, on the other hand, have no legal protection whatsoever. As such, they can be and are killed in their thousands. Q How is it different to fishing? When envisioning dolphins gliding through the ocean with fish-like efficiency, it's easy to forget that they are in fact not fish, but mammals. 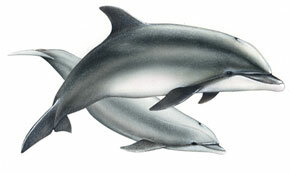 Dolphin calves, like the young of other mammals, drink milk from their mothers. 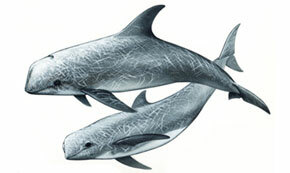 Dolphins and whales are the descendants of land-dwelling creatures which returned to the sea about 50 million years ago. Thus, while dolphins and whales share their environment with fish, they do not share much of their physiology (dolphins are in fact more closely related to camels than to fish!). Q Does Japan own dolphins? 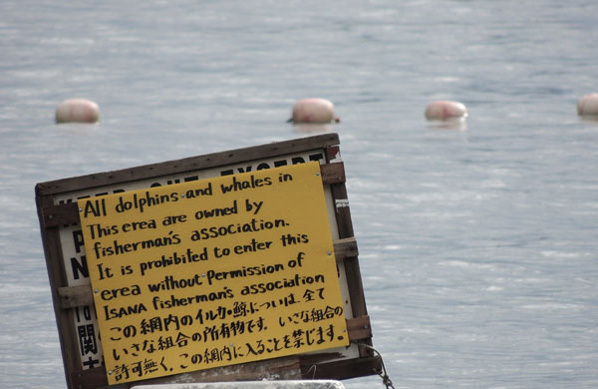 A fishermen's association sign floating in Taiji's cove asserts ownership of wild dolphins driven into the cove. 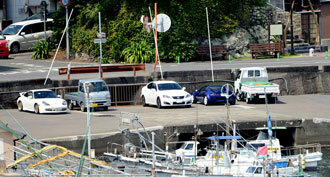 As you can see from this sign, the fishermen believe that they “own” the wild animals they trap in Taiji’s cove. Obviously, even if the fishermen did own the dolphins and whales, that would not entitle them to be cruel to them. But leaving this aside, the simple fact is that Japan, let alone the local Taiji fishermen’s association, does not own the dolphins and whales. These animals do not live in Japanese waters, but merely pass through them on their long migrations. Not much is known specifically about the migration routes of dolphins and small whales, but we know from dolphins that have been satellite-tagged and tracked that they travel hundreds or even thousands of kilometres. 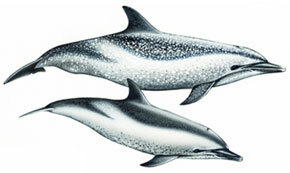 We don’t know how far the dolphins and whales travel in their migrations, or which countries or oceans they might visit. But we can say with certainty that these wonderful animals are citizens of the entire planet, and are not owned by Japan for their exclusive, commercial and cruel advantage. Q How many, and which species, are killed? In recent years in Japan, more than 10,000 dolphins and small whales have been killed each year. In the town of Taiji, where the world's largest drive hunts take place, around 2,000 dolphins are killed annually (another 250 or so are captured and sold to aquariums). Q What is the conservation impact? On top of its cruelty, dolphin hunting is also a serious conservation concern. It has claimed over a million dolphins and porpoises along Japan's coast in the past 70 years. Most of the species hunted at Taiji exist in large populations around the world, and are not considered to be at risk of becoming endangered or extinct. But intensive drive hunting has had a devastating effect on local populations, with unknown consequences for marine ecosystems. The IUCN Red List, the most comprehensive list of the conservation status of biological species, states that the striped dolphin, one of the most exploited species, has been “completely or nearly eliminated" from waters off the Japanese coast. 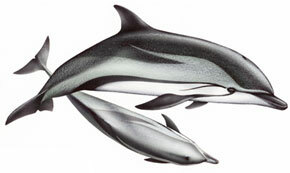 There have been steep declines in catches of other species targeted by drive hunting, such as bottlenose dolphin and pantropical spotted dolphin, indicating depletion of these populations. The IUCN notes that the drive hunting method - which involves intensive harassment of the animals causing sometimes fatal injuries - can kill many more than just those captured, multiplying the damage done to dolphin and whale populations. While the IUCN conservation status of most species killed in Taiji is “Least Concern”, the short-finned pilot whale and false killer whale are listed as “Data Deficient”, indicating that their global populations are unknown. We know that short-finned pilot whales that migrate along the Japanese coast have been reduced to a population of 4,000-5,000. 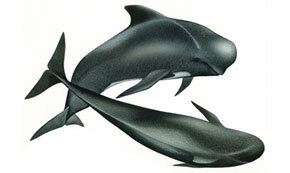 False killer whales are also relatively rare. The IUCN lists drive hunting as a “major threat” to both species. It is not known how many short-finned pilot whales and false killer whales live elsewhere in the world to maintain these species if drive hunting eliminates the populations unfortunate enough to pass Japan. What is clear is that the Japanese fishermen pay no attention whatsoever to the ecological and conservation damage they cause every day for six months of the year. Q Don’t the Japanese people need dolphin and whale meat for food? 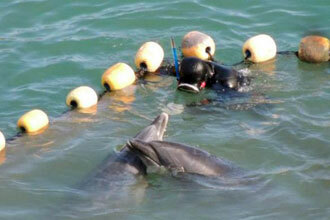 The main purpose of the drive hunts conducted at Taiji is the capture of dolphins and whales for aquariums. Those not selected for aquariums are slaughtered for meat, more as a by-product than an essential source of food. Dolphin and whale meat is rarely eaten in Japan today. The small demand remaining amongst the older generations is more than met by Japan’s large-scale whaling programme. In fact, there are 5,000 tonnes of unwanted whale meat sitting in freezers around Japan. There is no need to supplement this oversupply with dolphin and whale meat obtained through drive hunts in Taiji. Q Isn’t it a cultural tradition? The standard defence of dolphin hunting offered by its supporters is that whaling is a traditional practice dating back hundreds of years, and an important part of Japanese culture. That an activity has occurred for centuries does not, of course, mean that it should necessarily be continued. Many historical practices have been discontinued and are considered inhumane by today’s standards. But even if tradition were a good reason to continue inhumane practices, it would not mean drive hunting of dolphins should continue. For there is absolutely nothing traditional about modern drive hunting. Whaling dates back over 1,000 years in some areas of Japan, but its historical nature was very different to that of today's drive hunts. In times past, subsistence fishermen using non-powered vessels caught a very small number of whales. These early whalers, who disagreed with the indiscriminate killing of whales, actually opposed the introduction of modern motorised whaling from Norway in the 1860s. Regular dolphin drive hunts capturing thousands of dolphins and whales date back only to 1969. To make a complete mockery of the claim that these modern hunts are ancient tradition, the high-tech speedboats used in Taiji are equipped with GPS, radar and the latest fish finding sonar. Moreover, the purpose of today’s drive hunts is the supply of a relatively new industry – the dolphin entertainment industry – which did not develop until the 1960s. One could also ask: If drive hunting is a proud Japanese tradition, why does Taiji go to such lengths to cover it up? (to read more about this, please see the cover-up). In short, the claim that drive hunting is ancient tradition is ludicrous. We should take it no more seriously than we do another of Japan’s claims about whaling - that its commercial fleet off the coast of Antarctica captures whales for “scientific research”. Q How is dolphin hunting different to whaling in the Southern Ocean? In the Southern Ocean off the coast of Antarctica, Japan hunts large whales (minke whales, fin whales and humpback whales). In separate hunts in the waters off Japan, Japan hunts small whales (dolphins and pilot whales). The hunts off Japan are bigger on an animal-to-animal basis (killing nine times as many animals in the 2012-13 season). Japan’s Southern Ocean whaling is limited to an extent by a 1986 ban on commercial whaling (Japan is able to continue by claiming that its whaling is not commercial but for “scientific research”). As the ban does not cover small-type whaling, Japan is able to kill an unlimited number of dolphins and pilot whales for commercial purposes. The method of capture and killing also differs. In the Japanese coastal town of Taiji, dolphins are herded into the shore in “drive hunts” and killed using metal spears. In the Southern Ocean, whales are killed with harpoons launched from ships at sea. As the Southern Ocean hunts take place in international waters, it has been possible for the anti-whaling group Sea Shepherd to physically interfere with the hunts, significantly reducing whale catches in recent years. In contrast, in the hunts off Taiji, dolphins and whales are herded to the shore through Japanese waters, where Japan has enforcement powers (and indeed the drive hunt boats are guarded by an armed Japanese Coastguard ship. Q I’ve seen "The Cove" – is this the same issue? Yes, the Taiji dolphin hunts, the world's largest drive hunts, were brilliantly documented in the Academy Award-winning film "The Cove". As well as the hunts in Taiji, there are large dolphin hunts along the northern coast of Japan, and in other places such as the Solomon Islands and Peru. AFD is focusing initially on the hunts in Japan, but subsequent campaigns will extend to other places where dolphins are hunted for commercial purposes. Q What is the role of aquariums? The main economic driver of Taiji's dolphin hunts is the capture of dolphins to sell as captive performing dolphins. As the source of the demand for these dolphins, paying what can be more than $100,000 per dolphin, the role of aquariums in the dolphin hunts is crucial. Not all aquariums purchase Taiji dolphins - it is in fact illegal to acquire dolphins captured in drive hunts in Australia and the United States. However, hundreds of facilities in countries with little or no animal welfare regulation purchase hundreds of dolphins from Taiji each year. Sadly, the conditions in these facitlies are often appallingly inadequate. Q What can I do to help? If you’re concerned about dolphin hunting and captivity, the most important thing you can do is to join us as an AFD Dolphin Defender, and to ask your friends to join too! We are committed to targeting every dollar and every signature of support to the uses which will maximise the benefit for dolphins. Every Dolphin Defender genuinely makes a difference to what we can achieve. If you are a scientist, please consider joining over 200 members of the international community of marine mammal and conversation scientists as a signatory of the Scientific Statement Against the Japanese Dolphin Drive Hunts. Have you seen "Doolin's Story", our short animated film telling one dolphin's tale? Q Is my donation tax deductible? Unfortunately, donations to Action for Dolphins are not tax deductible. AFD is a charity registered in Australia, however we do not have deductible gift recipient ('DGR') status. Unfortunately, the only animal welfare charities able to claim tax-deductible status in Australia are those providing direct care to animals (such as pounds and pet shelters). This restricted definition means that AFD, and many other animal welfare organisations, miss out. While we understand that being tax deductible is important, our amazing supporters have encouraged us by not allowing this issue to influence their financial support. If you have any questions about donations and tax deductibility, please don't hesitate to get in touch with us at [email protected]. Q What is Action for Dolphins’ Notification Statement? Changes to Australian privacy laws mean that from 12 March 2014, Action for Dolphins has new obligations relating to how we collect, hold, use and disclose personal information about you. Action for Dolphins collects personal information for the purposes of carrying out its functions as a fundraising organisation, employer, tenant and other associated functions. Personal information includes your name, address, occupation and anything that can identify you as an individual. As a fundraising organisation, Action for Dolphins will collect personal information about you including demographic information (eg name, address, date of birth), information about family members and/or associates, information about personal and social circumstances, financial information, education information, employment information and other information necessary for the purposes of carrying out its core business functions. Action for Dolphins will not collect, use or disclose sensitive information about you unless we require this information for one of our functions or activities and we have your explicit consent. Action for Dolphins collects personal information from a variety of sources including the individuals to whom the information relates, family members and associates, other fundraising organisations, community service organisations, schools, employers, and other individuals and/or entities who may have information relevant to Action for Dolphins’ activities. As a general principle, where personal information is not collected directly from the individual concerned, Action for Dolphins will take reasonable steps to ensure that the individual is informed about the collection unless the individual has previously expressly or impliedly consented to the collection. Personal information will only be collected in a manner that is lawful and fair. Action for Dolphins will only use and/ or disclose information for the purpose(s) for which it was collected unless otherwise required or authorised by law. Action for Dolphins may be required by the legal process (subpoena, search warrant, Notice of Discovery) to disclose personal information. The country to which the information is to be transferred has a system of privacy protection at least equal to the Australian system and incorporates a means of taking action for any breaches of privacy. Countries to which information is currently transferred for the purposes of management of personal information include New Zealand, the United States of America, the United Kingdom, the member nations of the European Union, India, Singapore and China. Action for Dolphins will take reasonable steps to ensure that all personal information it holds is accurate, up-to-date, complete, relevant and not misleading. Individuals may apply to Action for Dolphins to correct any personal information held by Action for Dolphins and Action for Dolphins will consider all such requests. If Action for Dolphins does not amend the information as requested, we will provide written reasons for the refusal to amend the information. All requests for Access or Correction are to be directed to the Action for Dolphins office, the contact details for which are set out below. As a general rule, all persons have a right to access their personal information held by Action for Dolphins. There are some circumstances where Action for Dolphins is permitted to deny access to personal information such as where the access would have an unreasonable impact on the privacy of others or where granting access is unlawful or denying access is required or authorised by law. Other grounds are set out in the APPs. Action for Dolphins is allowed to impose reasonable charges for providing access. Action for Dolphins has established processes for dealing with Complaints relating to Privacy. All Privacy Complaints should be directed to either our office email address at [email protected] or forwarded to our mailing address below. All Complaints will be acknowledged and a response will be provided as soon as practicable. If you are not satisfied with the management of the complaint or the response, you may request that the complaint be reviewed by the Chief Executive Officer. You may at any time also lodge a complaint with the Office of the Australian Information Commissioner. We've tried to answer the most common questions here, but if there's something we've not covered, we'd be delighted to answer any queries you have.